Jump Drives are the only known means of faster than light travel. They allow spacecraft to travel through a wormhole that follows a “jump chord” between two nearby stars. Jump-1 chords connect stars up to 1 parsec apart. the chord has a well defined start and end point, usually within the inner system of its star. The spacecraft travels in normal space to the local chord endpoint. It then engages its jump drive, and disappears from normal space. Approximately 5 days later the ship It instantly emerges from jump at the chord’s other endpoint, near to the destination star. Travelling to and from the jump point in normal space is often the longest part of a journey. Even with the best commonly available space drive (antimatter-catalysed fusion direct drive, capable of 1G continuous thrust) it can take several days to travel between the jump point and a world in the habitable zone. Travel to the outer system often takes weeks or months. 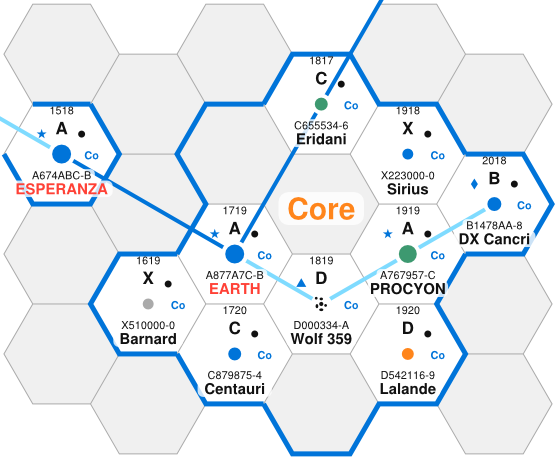 Until recently, Earth was dominated by a vast computer network called the “Virtuality”. Over the centuries, hundreds of billions of people uploaded their minds into this “life after death”. Eventually, living people came to be a minority who were largely excluded from decision-making. Out in the living world, nation-states still existed, cooperating through a fairly strong “Earth Union” – successor to the United Nations. However, aside from a tiny elite, most living people felt entirely disenfranchised. Many chose to go to the colonies rather than live as a second-class citizen. In the last decade, telepathic radicals from the colony world of Esperanza have infiltrated, and entirely overturned this ancient, conservative society. One by one, they seized control of Earth’s nation states, destroyed the Virtuality’s data centres, and imposed their own brand of totalitarianism. Finally, four years ago the central Earth Union fell completely under their sway, and the remaining conservative nations were conquered in a short, bloody war. Today, the “Next Step” radicals are still consolidating their hold over Earth, whilst pushing aggressively on into the Outer Planets. I use rsync for backups, and it has a very nice feature, where it uses hard-links to a reference directory tree, in order to reduce space. That works well, but sometimes the chain of links is broken, and disk space gets used up unnecessarily. The most common cause is when I move a file – rsync can’t tell that it’s moved, so the new location gets its own copy. That can be expensive if I’m renaming a load of videos! So, it would be nice to find a tools that can spot these cases, and replace the duplicate files with hard links. There are a load of candidates, but none of them seem to quite meet my requirements. Files must match metadata as well as content. Hard links merge the metadata, so if two files have different owners, then I can’t replace one of them with a hard link. I’m willing to accept some variations in meta data – access time, certainly. Probably modification time, and maybe even group. The ideal tool would let me choose what metadata is important to me. I probably want to set a minimum file size. The benefits of reducing duplication are pretty minimal when file sizes are small. I need to be able to blacklist/whitelist files by name, or by location. If a file is ever modified, then all of its link-brothers will also get modified. That’s no so bad for back-ups, which are hopefully immutable. But if I ever use this tool on files in use, it could be catastrophic. I’d like to restrict hardlinking to between directory trees, rather than just will-nilly within a tree. That would preserve the integrity of each back-up snapshot, just like rsync does. The number of hard links per inode is limited on some filesystems (particularly ext4 – which is what I’m using). The tool must know about this limit. freedup Overall, the description makes it sound like a solid tool, and the documentation seems relatively complete. However, when I built it, I noticed that the Makefile attempts to write new lines into /etc/services, and yes, the program does contains socket/server code – which is apparently triggered by undocumented options. Personally, I’m a bit leery of file-system level tools that contain undocumented server code, so I’ll not be using it. fdupes This is a popular tool (packaged in Debian), but I don’t think it covers any of my metadata requirements. rmlink This is a fairly new tool – it’s not packaged, so i had to get it from github. It’s got good name filtering, but it doesn’t check metadata, allow for size or directory tree limits. Finally, it doesn’t natively support hard linking – you can give it a custom command to use, but that could not easily be taught about hard link limits. On the plus side, rmlink is reportedly very fast. Finally, the name is horrendously dangerous. I caught myself editing “rm” commands, because I’d not been paying attention when I did a reverse history search… Had I not noticed, and hit return, I might well have found myself needing those backups. fslint This is a GUI tool. Not much use on my server. hardlink is a pythobn script. I’ve not investigated it too much since there’s no online documentation. rdfind is a very basic tool. It doesn’t have any of the features I’m looking for. duff seems like a solid tool. It can’t make hard links, only report duplicates. It does permit me to set a minimum file size. No coverage for any of my other requirements. The fdupes Wikipedia page contains a useful list of other such tools. I may investigate more of them later. EPS, XPS or PIR for EWI? The ideal is EWI to walls, continuous with similar EPS [expanded polystyrene] on OSB [a kind of plywood] boarded over the top of the rafters, tiles/slates replaced but a bit higher up. The roof OSB is adequately airtight, without any problems with interruption by internal trusses etc. Unfortunately EWI can’t be relied on to be airtight, so either an external rough-render (breatheable) on the brickwork before EWI-ing, or the internal plaster wd be your wall airtight barrier.That (like IWI [internal wall insulation]) is problematic because of joist penetrations and joists so close parallel to wall that you can’t make the internal plaster continuous through the floor thickness. Also needs connecting up with roof OSB (or with over-joist membrane if trying to air-tight at loft floor level). What do you think is more important right now for the federal government: to investigate possible terrorist threats, even if that intrudes on personal privacy OR not to intrude on personal privacy, even if that limits its ability to investigate possible terrorist threats? Those were terrible yes/no options that absolutely do not allow people to express a nuanced view. This is not an either/or issue. A moderate would say that authorities should usually respect privacy, but they should also investigate serious threats. The wording of the options guides moderate respondents towards the authoritarian position. Option a. “don’t invade privacy” is an extreme, equivalent to “never invade privacy”. But option b. “investigate threats” allows for the moderate position “investigate only serious threats”. A moderate respondent will want a little of both, so they can only choose b. However, I’ve just actually measured it, and the situation is more complex… I timed how long it took each of them to boil a single cupful of water. Unsurprisingly the 3kW electric kettle boils the water much more quickly, but it takes ages for its temperature sensor to notice. The electric kettle turned off at almost exactly the same time as the stove-top kettle started to whistle. So for small volumes of water, it’s a draw. For larger volumes of water, the electric kettle is noticeably quicker. Why then, do I find the stove-top kettle much more convenient? I think it’s because it has a better “user interface”. When the electric kettle has boiled, it clicks off and I often finish whatever else I’m doing before going to use the hot water. By then, it’s usually cooled down a bit, and I have to turn it back on and wait to bring the water back to the boil. (Actual boiling water is very important for making tea.) OTOH, the stove-top kettle whistles and stays boiling, so I am forced to go and deal with it immediately. The result is that I get my tea made a little bit quicker, with less waiting around. Interesting. Perhaps electric kettles should replicate that UI, by having a continuous alarm, instead of automatically turning off.